This print was executed by Richard Kegler from the idea that many Americans have no idea how far or close countries in Europe are and likewise many Europeans do not realize how vast the United States is. 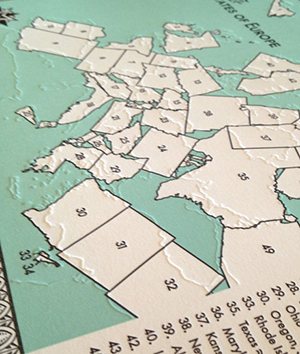 The approximate land masses of each state and each country were compared and paired up to form this fictional landscape resembling a vintage map. 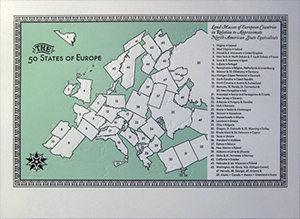 Designed on a computer and letterpress printed on a Vandercook SP-20 using photopolymer plates in two colors—Black and Sea Foam Green—as well as a blind emboss of the outlines of Europe's borders.